How to make others share my flip page-turn books on social networks Linkedin, Twitter? Modern society, people tend to used to those popular social networks more closely. Anyone around us can list several sites without deep thinking. Although we may not log in those sites, you have to be heard of their name from those around you. 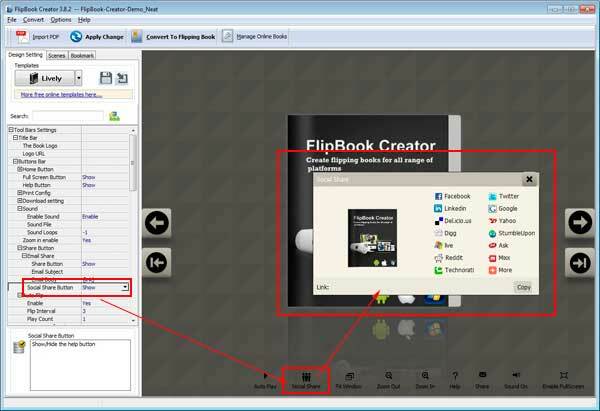 FlipBook Creator both makes flipping flash books and enables you to share the outputting page-turning books with others through social networks. 1 Launch FlipBook Creator, see the settings listed left. 2 We reach to the options Tool Bar Settings -> Buttons Bar -> Share Button -> Social Share Button. 3 Make Social Share Button Show.